Home / Uncategorized / How to Share a Quarter – Become a Freestone Beef Community Organizer! How to Share a Quarter – Become a Freestone Beef Community Organizer! Calling all “Freestone Beef Community Organizers!” Many of you asked us, “I want to be involved but I can’t use an entire quarter for myself – how can I help?” That’s where sharing comes in! Still on the Fence? For those of you that are wondering why you might consider taking on the leadership of purchasing a quarter for your shared household and/or group of friends, please read our missive about the Community Supported Grassland model which highlights a few of our favorite reasons why. Ready to go! For those of you that are ready to take the plunge, start with the steps below to see how easy it is to spread the wealth and nourish yourself while enhancing local grassland ecosystems. Step #1 – Get Some Freezer Space! Determine how much freezer space you have available to you and/or check craigslist or your local store for an affordable chest freezer. Chest freezers double as great ways to store extra summer fruit, and to make your own frozen dinners for easy and quick meal prep. A good rule of thumb is that you’ll need about 1 cubic foot of freezer space per 25lbs of meat. Step #2 – Email/call your friends! One other friend is definitely signing up for the beef share, but she only has 1 cubic foot of freezer space, so you look at the chart below and realize you need at least 2 others to share it with, and better yet 3 others so she can save some room in her freezer for other summer treats. So you make a couple of calls, send a few texts, and pretty soon you’ve got three additional beef lovers to split a quarter 5 ways – Yum! Okay, you’ve spent some time planning and you decide to get a 3.5cf chest freezer off of craigslist, you’ll pick up the quarter on behalf of all your friends and store it until your beef pick-up party when all your friends will come over to pick up their shares. Wait, that sounds like a lot of work – what do I get in exchange? To start with, you get the security and nourishment that comes with securing local protein for months to come, and an ongoing relationship with the land, people, and herds that produce your local protein. But for our “Freestone Beef Community Organizers,” you also get a free Grass Fed Beef and Ranch Tour “Experience” with chef Matt Roberts, which includes a 3 hour cooking class, farm to table lunch, and VIP tour of the ranch on the following dates (pick one: Sep 1, Sep 2, Sep 30, Oct 6, or Oct 7) for you and a friend.” If this “reward” doesn’t suit you, contact us at erin@freestoneranch.com for something customized to YOU. Yum! Step #4 – Organize a beef pick-up party! Yes, today’s the day. Your friends are drooling in anticipation for their beef. They bring their coolers, calculators, pens and paper ready for the equitable sharing. There may be some cuts that one friend will get that another will want, and vice versa, that is all part of the fun. 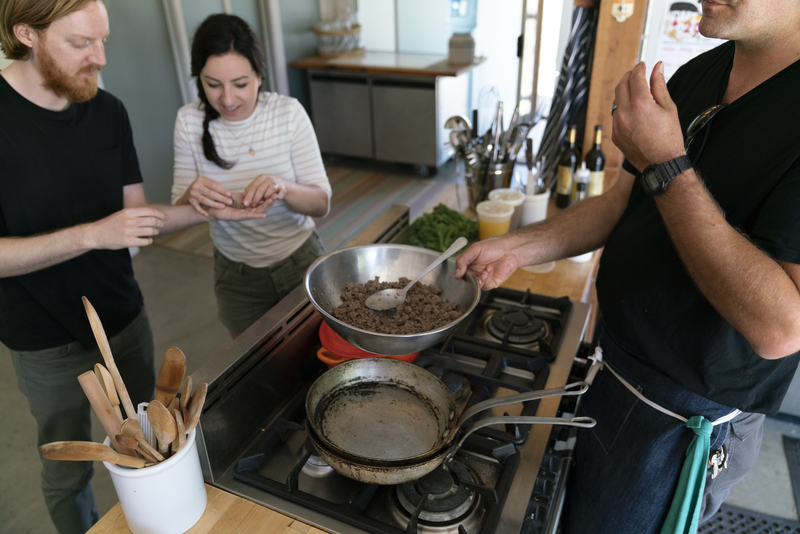 You’ll be able to swap recipes later and cook meals to share, all the while building your skill at producing heartfelt home-cooked meals from protein from your bioregion. Contact Erin at erin@freestoneranch.com if you have any questions whatsoever and we’ll be happy to help you out!